As I was walking along a certain street in Kahawa Wendani, i had to tread slowly on stones that had been laid on the road by a contractor who was paving the road on behalf of a certain supermarket. On a parallel street, another supermarket had paved the road all the way to its parking. This got me thinking that road construction has now turned from been a government affair to a private enterprise affair. I thought the reasons that private enterprises were now taking to pave roads is because of failure of state organs to do their jobs.This is because the concerned state organs are stuck in a stone age. Wikipedia defines "stone age" is 'The Stone Age is a broad prehistoric time period during which humans widely used stone for toolmaking'. For this article, we shall define the stone age as a current time frame during which humans widely use stones for decision making or exist in an environment similar to one experienced in the pre historic stone age. As for the government, they have seen it fit to return their citizens to the pre historic stone age by been moribund, as the NCCK claim. 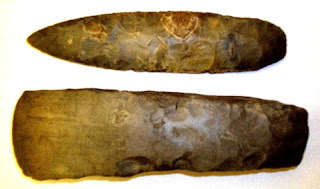 During the pre-historic stone age, human beings probably did not have proper management of resources, and probably tended to missalocate them. But this was not a problem, since the resources were too many. In this age, when people are many and resources are few, the situation tends to become a critical one if you misallocate them. The amount of resources is made worse by the fact that we have already destroyed and misallocated our forests, which dictate the availability of other resources. The Government is not the only one that can be said to be moribund, most other administrators in charge of various organizations including companies and other public institutions like universities are giving the government a tun for its money. they too have decided to become moribund. only problem with this, is that we are at an age where the citizens will not just sit back as this institutions become moribund. They in turn, have decided to turn into the pre historic stone age, and have picked stones as their tools of decision making. This may be due to the fact that they do not have guns and the designer scent that has now become a signature of streets in the capital city- tear gas. Stones have become such a crucial tool that the demand for windscreens and other car glass accessories has shot up despite the economy behaving as if it was operating in the stone age. College students , usually the first in adoption of things, have embraced the re-emergence of stones as a tool, and have really utilised them , with several colleges deploying these stone tools every week. What we are left to wonder, is how long it will take for the administrators to stop operating in the stone age, and to adopt fruitful operations and problem solving methods.After all, the current students are not the first to deploy stones as a decision making tool, and the fact that they go way back in time to solve problems indicate a break down in other so called "ISO certified" modern decision solving methods. this is so true when it is discovered that some of the problems that they try solving using stones are usually in the second or greater attempt at solving the same problem. Worst of all, is our moribund government, which has left us wondering as to how long will it be moribund. Maybe evolution to better decision making tools has hit a snag, and they might need a revolution that has faced other moribund governments through the world. It has been proven before that citizens armed with stone age tools can be a threat to a government armed with iron age and scented designer perfumes that elicit tears from their citizens and tears of joy from the moribund leaders. Take time to stop and think if you are moribund. If you find yourself engaging in blaming who caused a problem rather than solving the problem, then you are still stuck in the stone age, and it is recommended you evolve.